MusicIntervention blog is an educational, you-can-change-the-world, musical adventure for curious minds, grassroots practitioners, wacky theoreticians, and of course, music lovers of all kinds. As much as MusicIntervention serves these target publics, it is also an adventure for its writer: me! Without a doubt, I am more knowledgeable about the topic of music intervention than just a mere three months ago. Whether reading a phenomenal article about the power of music to strengthen a community or writing about music’s healing effects on peacebuilders and those traumatized by war, the words and phrases on the page become the building blocks of this new study. Reaching a decision on what to discuss in these posts is not always straightforward. There are times that I stumble upon a perfect topic for exploration either by word-of-mouth, social media, or reading my daily collection of online newspapers. Other times, I begin to wonder if writing about a nightmarish masterclass experience from my past might be more informing than anything else appearing on my radar (yes, all musicians have sustained traumatic masterclass experiences and I’m not afraid to admit it anymore!). One of the nifty techniques that I use to avoid utilizing embarrassing experiences of mine as “educational material” is to send out Google Alerts every day for the following five search inquires: music and peace, youth empowerment, conflict transformation, music education, and music intervention. The results vary day to day, week to week, month to month. There are days where the level of good content is slim and other days where I cannot find the time to read all of the new articles and resources between my full-time job, practicing, spending time with my family, and having a bit of a life! Notice, I didn’t mention sleep. Last Tuesday was one of those “slim pickin’s” days. None of the search engine articles were intriguing. Sighing to myself I wondered if I had hit the bottom of the Internet. What if there were no more music intervention youth empowerment and conflict transformation organizations out there that I hadn’t already found? As my bleary eyes skimmed Ha’aretz.com, an article sparked my attention. This article reported on an apparent youth empowerment music intervention school called the Silwan Ta’azef Music School. Ta’azef Music School, housed in the Madaa Creative Center (Madaa in Arabic translates to horizon in English), resides in Silwan, a controversial neighborhood right outside of Jerusalem’s Old City’s walls. What shocked me the most was never having heard of such a school after recently living over a half a year in Jerusalem. If I had known, there is no question that my viola and I would have visited! The majority of Silwan’s population is Palestinian, with several pocket-fulls of Israeli settlers that live in highly fortified, secured compounds that were until recently Palestinian homes. These homes were either confiscated based upon the Absentee Property Law or sold to the Israeli settlers by Palestinian owners. All of the buildings are basically built on top of each other on the hilly, over-populated land. 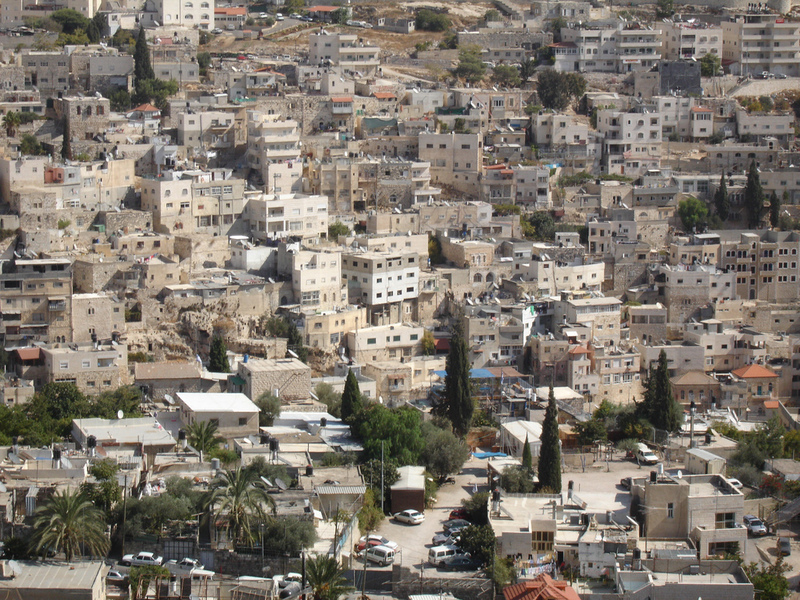 According to archeologists, it is believed that Silwan is also the location of the ancient city of King David. This is one of the reasons why Jewish settlement in the area is of high priority. To add to the mess, this land is technically a part of East Jerusalem annexed by Israel during the 1967 War. The annexation is deemed illegal by international law and the majority of the international community. If you speak with government officials in the Jerusalem Municipality responsible for East Jerusalem Affairs, they will tell you that Palestinians (whom they call Arabs most of the time) predominately build without permits because they rather avoid paying taxes. If you speak with members of the Silwan neighborhood, they will tell you that they have tried to apply for permits to build houses and are always denied, hence they build without permits. As the adults bicker about these issues, the children of Silwan grow up in a very hostile place without children-friendly facilities, such as playgrounds, colorful murals, and even at the bare minimum, sidewalks. What a relief to know that at least Madaa is there! After cutting and pasting in a quick Google Search, Madaa’s website popped up. Unbelievable! As I hurriedly passed through all of its pages and links, I was soon led to other music intervention organizations and then other music intervention organizations and then others. Let’s just say I hit the jackpot for a “slim-picken’s” Tuesday. If only every day could be that productive and full of good news. And now I would like to introduce the six new music intervention organizations that have been added to the MusicIntervention Blog under Youth Empowerment or Conflict Transformation and two new blogs that can be found on the BlogRoll. Enjoy your perusing! Manhattan New Music Project(MNMP) empowers youth in underserved communities, using the performing arts to develop essential life skills and achieve academic success. We build partnerships among artists, students, teachers and parents that focus on the creation and performance of new works. 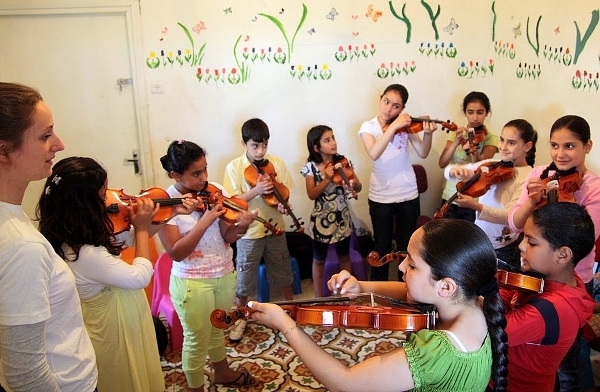 Since October 2007, weekly music lessons are given by professional musicians to the children of Silwan. The music school offers an introductory course to music for children ages 4-12, and group instrumental lessons to children and teenagers. The main concept behind the music school is to offer an outlet for creativity and emotions through the playing of music, and to support the personal and musical development of every child. All classes in the music school are held in groups, and much emphasis is given to social interaction and personal social development. The VH1 Save The Music Foundation is a non-profit organization dedicated to restoring instrumental music education in America’s public schools, and raising awareness about the importance of music as part of each child’s complete education. Since its inception in 1997, the VH1 Save The Music Foundation has provided $48 million in new musical instruments to 1,800 public schools in more than 100 cities around the country, impacting the lives of over 1.8 million children. Established in 1996, Pontanima is an interreligious choir based in Sarajevo, Bosnia and Herzegovina. It is widely acclaimed as an innovative peacemaking project, a shining ambassador of Bosnia-Herzegovina, and a major contributor to the cultural life of Bosnia-Herzegovina. The choir celebrates its tenth anniversary in 2006 in affirmation of the vision shared by the founding group of singers, who allowed themselves to hope in the future and dreamed that spiritual music could heal and reconcile the people of Sarajevo and Bosnia-Herzegovina. Musicians without Borders is an international network organization that uses the power of music to connect communities, bridge divides and heal the wounds of war and conflict. Musicians without Borders initiates projects, develops methodologies and organizes concerts and international conferences on healing and reconciliation through music. Since its founding in 1999, Musicians without Borders has organized successful projects in Bosnia and Herzegovina, Macedonia, Kosovo and the Middle East. Musicians without Borders UK use music to reduce the stressful effects of war and to connect people across cultural, political and religious borders for peace and positive change. MwB UK is affiliated to the MwB International organisation founded in 1999 by Laura Hassler and a group of musicians in the Netherlands in response to the Kosovan war. Since then the network has grown with projects in Bosnia-Herzegovina, Kosovo, Macedonia, Uganda, Rwanda, the Middle East, the Netherlands, the USA and the UK. The Mitrovica Rock School restores rock music culture to the ethnically divided city of Mitrovica, Kosovo. Local musicians teach the city’s future rock stars. Throughout the region, the Mitrovica Rock School is known as an example of a new way to bridge cultural differences.